When John Warnes boots his car it can mean one of two things. Either he’s unleashing 240kW of turbocharged XR6 power or he’s firing up his elaborate in-car computer system. Speed is measured in km/h or MHz. An electronic technician by trade, John Warnes lives and breathes computers and he’s a big fan of MP3 music. In fact, the ability to take MP3s everywhere he goes was the main motivation for the in-car PC set-up. What you see here is the product of tireless development which kicked off in John’s previous Holden VL Turbo (see Ingenuity Extreme). So let’s start by looking at the first component of the system – the power supply. Interestingly, John runs a so-called "tank circuit" which ensures there are no voltage drops to the PC. This system comprises a large capacity diode connected to the car battery and a secondary sealed lead acid (SLA) battery which feeds power directly to the PC. A 200W DC-DC Mini ITX power supply is installed alongside a Mini ITX motherboard which is extremely compact at just 17cm x 17cm. 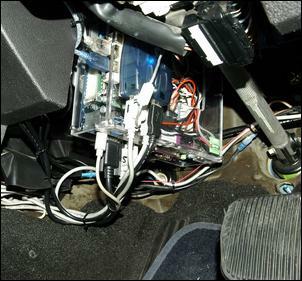 The hard drive is mounted under the dash near the driver’s left foot – the BA Ford has plenty of room to spare in this area. Note that the hard drive is mounted vertically to prevent damage to the heads over bumps. The computer runs an 80 gig drive at 1 GHz, has 512Mb of RAM and includes a CLE266 video card. Microsoft Windows XP is John’s chosen operating system. USB-type connections are used for all branches of the system. A thumb-type mouse and an illuminated Zippy keyboard (which is plugged in for occasional use) are USB driven - as is the on-dash LCD touch screen which is the interaction hub of the system. The screen is a top-of-the-line Xenarc product from the ‘States which provides a high resolution display and finger-tip control. A USB-driven Griffin Powermate volume dial can be found installed near the gear shift lever. In addition to enabling John to alter the volume of his favourite MP3s, this knob has a funky blue glow which matches the rest of the XR-spec instrumentation. To ensure crystal clear music reproduction, John uses a SoundBaster 24-bit six-channel external sound card which, again, is connected via USB. John says this eliminates the signal noise sometimes associated with traditional RCA leads. The six-channel sound card also offers the ability to individually adjust the gain on each speaker via the touch screen – this give John the perfect sound balance and distribution. John has also included a wireless LAN dongle inside the Ford’s roof – this allows communication with his home computer network when the car is parked in the garage. This comes in handy for downloading music which is stored on the home computer. 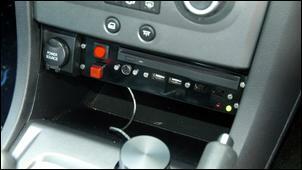 Another USB port is dedicated to an infra-red eye which allows communication to John’s mobile phone when it’s slotted into its on-dash holder. 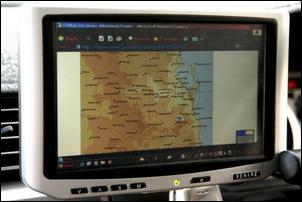 The IR connection to John’s WAP-enabled GPRS mobile phone gives in-car access to the internet. As seen here, John can access web pages and bring ‘em up larger-than-life on the Xenarc monitor. He often goes on-line to check out local radar weather images (this keeps him up to date on severe weather activities in the area). But, as we said, John uses the set-up mainly for music. John has a vast collection of MP3s stored on the PC and, using Winamp software (which includes an onscreen equaliser), he channels beats through an enhanced speaker system. 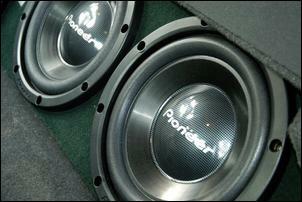 After passing through the sound card, audio signals are boosted by a US Audio 600W amplifier and are distributed into four Pioneer 5 x 7 full-range speakers and a pair of 12 inch subs. When listening to MP3s, John the clicks the system’s mouse to bring up one of many different visualisation screens. As he says, you never get bored. 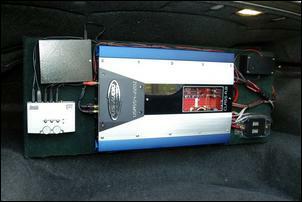 In addition to providing a home for the subs and amplifier, the XR6’s boot contains the external sound card with a switch mode power supply (to provide a clean 5V feed), a battery voltage display (for the secondary SLA battery) and relays for switching sound sources from the PC to the standard Ford head unit. 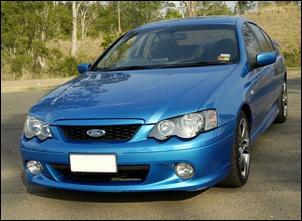 The standard Ford head unit is used when John’s not in the mood to listen to MP3s. 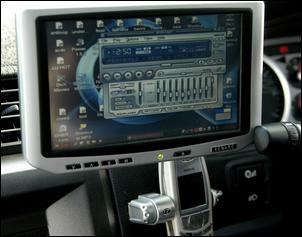 DVDs and CDs can be played – and CDs can be burnt – via a laptop style remote drive which is integrated at the base of the centre console. John says the reproduction of the Dolby Digital 5.1 is crystal clear when watching DVDs. Alongside the remote drive are two LEDs (a red LED shows hard drive activity while a green LED indicates power is switched on). There’s also a pair of spare USB ports, a pair of Firewire ports (which enable John to link up his video camera) and two buttons – one to power up the PC and another button to shut it down. A latching relay system is used to switch the PC’s power supply. John says one of the biggest advantages of his system is the wide selection of programs to suit the Windows XP platform. This has allowed him to use an on-screen keypad program (which effectively negates the need for the plug-in keyboard) as well as an OBDII program that lets him read information from the car’s ECU. 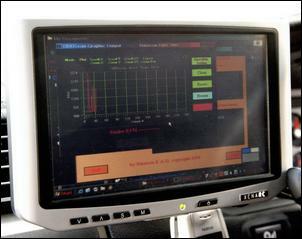 This photo shows rpm data obtained through the OBDII connection. John says he’s now got the set-up working 100 percent how he wants. There are no glitches and everything works unobtrusively. The only thing remaining on the ‘yet to do’ pile is the addition of GPS – this would take the system to another level of practical usefulness. Aside from that, he’s currently looking into an engine management remap to boost engine output to around 290kW. He certainly has plenty of onboard computing power – so now it’s time to unlock some extra combustion power!